Husband and wife duo Jason Moody and Earecka Tregenza have performed together across the United States, Canada and England, delighting audiences with their beautiful sound and captivating style. 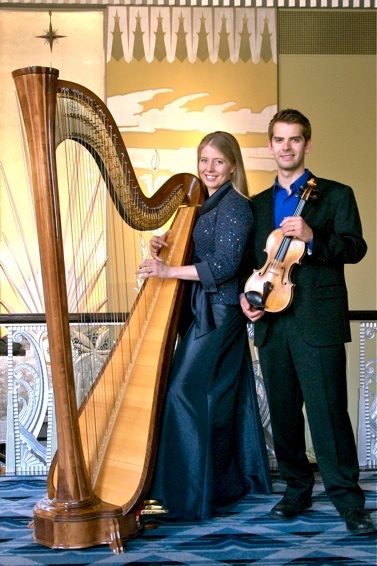 Jason and Earecka have performed with the Houston Symphony, the Seattle Symphony and are members of the Spokane Symphony, with whom they have been featured both as a chamber duo and as individual soloists. Both musicians hold Master of Music degrees from the Shepherd School of Music at Rice University, where they were awarded full scholarships in their respective instruments. They have been fellows of the Britten Pears Young Artist Program in Aldeburgh, England and were invited to perform with the Spoleto USA Festival in Charleston, SC. In addition to their active performance schedule, Jason Moody and Earecka Tregenza are faculty at Whitworth University, where they coach chamber music and teach individual lessons in violin and harp. The repertoire of Cascade Duo spans from baroque to modern including works by Handel, Boieldieu, Donizetti, Spohr, Ravel, Fauré, Saint-Saëns, Kreisler, Schaposchnikov, Kikta, and Andrès.